With Truckin' Man being layed off for the most part over the winter in this new job, he needs more projects! Since not all projects should involve remodeling, he is already working on the garden. Well, maybe not the garden, but plants for the garden. A time or two, we have tried starting our own plants by seed, but we don't put a lot of effort into it, and the plants survive sometimes, other times not. When they have survived, we are lucky if they they are producing vegetables by September. This year, we ( I mean he ) are taking things a little more seriously. 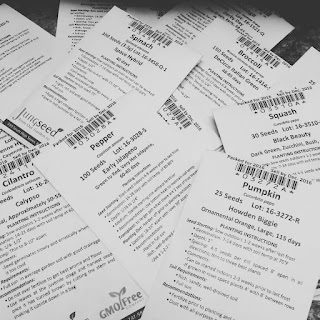 We ordered all of our seeds early. Had to replant once, because we had the light to far away from the plants. Do you raise plants from seed? Any tips 'n tricks? we started our seeds last week and have seen some serious action already! we thought about getting lights but in the end decided against it. keep us updated! I can't offer advice as I've never raised plants from seed, but I'd love to follow your garden. I hope you'll show us more. Kris, I give you so much credit for taking this on. This is one area I am clueless. I will love to learn from you. Good luck! Jealous! Yours look amazing. I've had two batches of seedlings fail. Argh. Going with starts this year, at least for tomatoes. Everything else seems to grow well from seed here. Maybe I'll get the hang of tomato seedlings next year. I've never started seeds before. I guess I just don't really have good space. I recently bought a townhouse with a little back yard and so I'm looking forward to having some gardening space this year. Sorry I don't have any tips or tricks to offer. I usually get mine from you!